Extension Leads | Efficient Sonics Ltd.
Extension Leads are available from Efficient Sonics with special end terminations, to safely extend the cable length of our transducers. 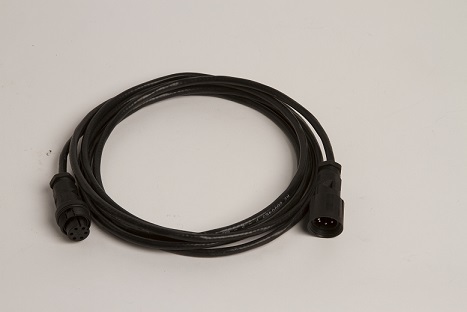 The Efficient Sonics Extension Leads are male to female and come with a suitable 6 pin plug at each end to provide a flexible and watertight cable extension to the connection between the transducer and Ultrasound Generator unit. Extending cables could typically become necessary if an ultrasonic system needs to be moved from its existing location and get re-installed elsewhere. In practice, however, we recommend that a transducer with the correct cable length is purchased from the outset, wherever possible. Our Extension Leads are ingress protected to IP67, however, we do not recommend that they remain immersed for a long period. Also, it is essential that the connectors are correctly mated with each other and fully tightened otherwise moisture could enter the connector and cause damage to the whole ultrasonic system. Efficient Sonics 5 metre Extension Lead with waterproof male and female end connectors. Efficient Sonics 10 metre Extension Lead with waterproof male and female end connectors. Efficient Sonics 15 metre Extension Lead with waterproof male and female end connectors. Efficient Sonics 20 metre Extension Lead with waterproof male and female end connectors. Efficient Sonics 25 metre Extension Lead with waterproof male and female end connectors. Efficient Sonics 30 metre Extension Lead with waterproof male and female end connectors.